Opentalk: Be better by talking app: insight & download. 500,000 Opentalkers from around the world. 2,000,000 Minutes talked every month. Opentalk's mission is to unlock world’s knowledge through voice conversations.We are simplifying voice conversations by solving for whom to talk, when to talk & why to talk. 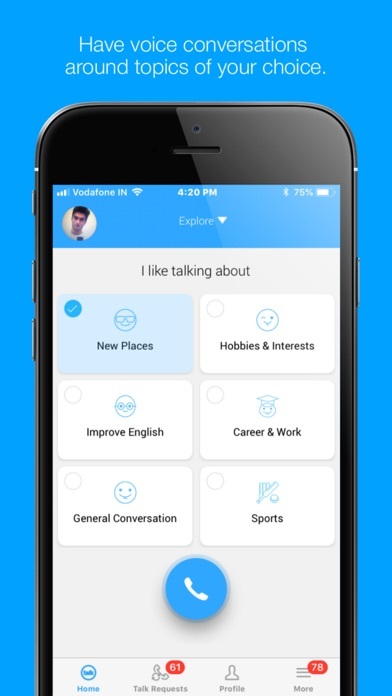 Opentalk is a mobile app that connects people globally based on their profile and interests to enable voice conversations. Conversations with new people, talk to new people, talk to students and alumni, college communication, talk to users from around the world, talk to global audience, conversations with global users. 11 July 2018 : Free! 10 July 2017 : Free!